이 불화는 1699년 대화원(大畵員) 의균(義均)을 비롯한 묘해(妙解) ·지영(智英) ·상명(尙明) 등이 참여해서 그린 아미타불화로서 불보살과 호법신중을 3폭에 나누어 그린 형식을 취하고 있다. 세 폭 모두 박락이 심하고 채색이 떨어져 나가긴 하였지만 가는 철선묘(鐵線描)의 양감 있는 얼굴, 균형 잡힌 신체비례, 섬세한 인물표정, 담채색의 은은한 색조 등에서 의균의 뛰어난 필력과 색채 감각을 잘 드러내고 있다. 또한 이 불화는 화폭의 구성에서 본존을 중심으로 보살, 나한, 신중을 모두 한 폭에 그리는 일반적인 불화형식과 달리 아미타불과 팔대보살을 한 폭에, 나한과 범천·제석천, 사천왕 등 호법신을 각각 좌우 2폭으로 나누어 그림으로서 부처님의 설법장면과 수호신중을 구분짓는 형식을 취하고 있다. 이 작품은 17세기말에서 18세기 초반에 걸쳐 팔공산 지역을 중심으로 활발한 활동을 한 대표적인 화사인 의균의 현존 작품 가운데 가장 오래된 불화라는 점에서 그의 초기의 작품세계를 이해하는 데 매우 주목되는 작품이다. This Buddhist painting, representing Amitabha Buddha accompanied by a Buddhist pantheon, was painted in 1699 (the 25th year of King Sukjong’s reign) by a group of painters including Uigyun, Myohae, Jiyeong and Sangmyeong. The painting consists of three panels, with Amitabha Buddha portrayed in one, and Bodhisattvas and Divine Guardians of the Dharma portrayed in two others. All three panels have frayed edges and are torn off in parts with paint peeled off from various areas. In spite of the poor state of preservation, the painting is, nevertheless, remarkable for the faces of the figures, drawn in thin lines, conveying a strong sensation of volume, detailed depiction of facial expressions, well-proportioned bodies and subtle light-toned colors, in a fine display of Uigyun’s experienced brushwork and unique flair for colors. 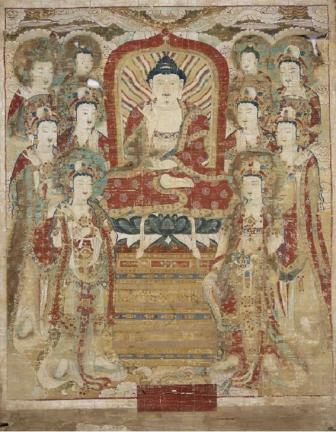 This painting also stands out for its composition in which, unlike other paintings of Amitabha where all attendant Bodhisattvas, Arhats and Divine Guardians of the Dharma are grouped together in one panel, the eight Bodhisattvas are portrayed in the left panel, and Arhats, Brahma and Indra and Divine Guardians of the Dharma are separately placed in the right panel, in a manner to distinguish the scene of Amitabha Buddha’s sermon from the pantheon of Bodhisattvas and guardians of Buddhism. As the oldest surviving work of Uigyun, a major Buddhist painter based in the Palgongsan Mountain area, active between the late 17th century and the early 18th century, this painting has an immeasurable value, casting light on his early style.